Classic modelling scissors suitable for a variety of cutting situations. With an active and a rounded, passive blade, both suitable for thinning. 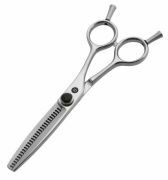 Developed for an even cut, without tangling the hair.